All of our bibs are hand made by us. All of our bibs feature a cotton print front of your choice and a terry cloth back. The fabrics shown in these pictures are for display. Some are no longer available. This is our standard adult bib. It is 19" long from the bottom of the neck, 19" wide with an 18" neck. 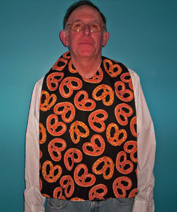 This bib is also available with a 14" or 22" neck. These are our most common adult bib sizes. All of the bibs are 17" wide at the bottom and have a standard 18" neck. Length is measured from the bottom of the neck. A 14" or 22" neck is available at no extra charge. All bibs have a velcro type closure. Snaps are available for $1.00 additional. The pictures below are of the extra long bib. We are showing them so that you can see how nice they cover the lap and how convenient they are if you are dining and driving. This is a picture of the optional pocket or crumb catcher on the bottom of the bib. This pocket goes across the width of the bib and is 5" deep. The cost of the pocket is $5.00 and available on any of our bibs. We feature 3 waterproof products. 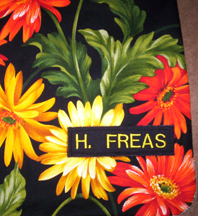 Shown above the flowers are a laminated fabric that can only be wiped off. The plain fabric shown is a water resistant nylon. The nylon fabric can be put in the washer and dryer. We also offer a waterproof fabric that is rubber/polyester. This fabric is washable but should be line dried. The water resistant or waterproof fabrics can be added to the back of any bib we make. This would give you a bib that is 3 layers thick. Fabric-terry cloth-water (proof or resistant). Here are samples of the personalization we offer at $7.00 per name. Size is limited, available on any bib. 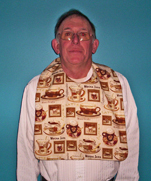 Over the years we have made many custom sized bibs, tailored to a person's needs. These bibs have been longer, shorter, narrower or wider. We have never charged extra for making special patterns or the time spent developing your special bibs. Our bib prices are based on material yardage and assembly time. There are no item numbers for adult bibs. Below are some of the abbreviations you can use on the order form, but anything you would type on the form comes through. If we still do not understand the order we will call or e-mail you. Size: This is neck size 18"(standard), 14", or 22"